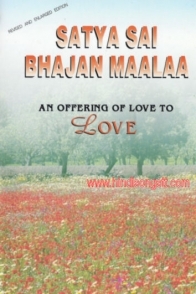 Satya Sai Bhajan Maalaa is An Offering Of Love To LOVE, dedicated to Bhagwan Shri Satya Sai Baba. This Revised and Enlarged Edition is a lovely compilation of 492 pages of Prayers, Chants, Hymns, Quaseedas, Christmas Songs and much more. 'Satya Sai Bhajan Mala', which was published in 1990 and was compiled and edited by the undersigned, was the first major bhajan book produced for the region. The experience gained from that exercise, the significant increase in the number of new devotional songs composed since then, as well as enhanced understanding and expertise attained through Baba's grace over the past eight (8) years, have combined to bring to fruition "Satya Sai Bhajan Maalaa - An offering of Love to LOVE". It represents the collective aspirations, support, dedication, commitment and loving, worshipful effort of many, only some of whom, it is possible to acknowledge here. We gratefully acknowledge the contribution of Dr. Sham Ramnarine, whose criticism, comments and suggetions helped set the standard eventually achieved and who assisted by readily making available new material. Our thanks and appreciation to Mrs Draupatie Maharaj for her painstaking efforts at proof-reading and moral support. Our heartfelt thanks and appreciation go out to Messrs Raj Jadoo, Rajnandan Persad and Ramnarace Sookhai, whose tangible support made this publication possible. Many others, who chose to remain anonymous, contributed significantly, motivating us to move forward through material assistance, words of encouragement and unstinting moral support. May Baba continue to Bless them. Finally, we record our deepest appreciation to our inspiration, Bhagavaan Shree Satya Sai Baba, for the opportunity to serve Him and Whose grace, in the final analysis, made this possible. May you derive as much joy in using it as we have in producing it.